It was not the beaches that lured me there, but the arts. Located just south of the Equator, the magnificent terrain and vibrant Balinese Hindu culture make Bali the most popular tourist destination in Indonesia. Hand-carved wooden figures, architectural details, and instruments are found everywhere in Bali. 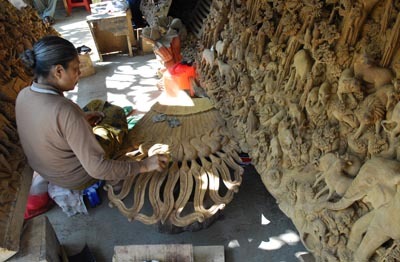 Local carvers meet the demand and also produce masks, furniture, and sculpture for export. Production ranges from touristy multiples to exquisite, one-of-a-kind masterpieces. I marvelled at the variety of original work, but was appalled to also see knock-offs of Native American totem poles and masks. 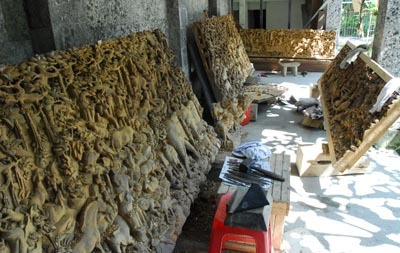 A number of woods are available, including teak, jackfruit, and Baliwood. It is difficult to find old growth on Bali today, though, so large stock is imported from Java. 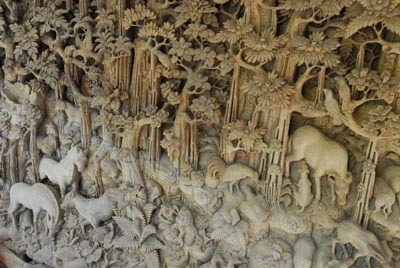 Only the smallest pieces are carved by one person; most are produced by several people at the same time, sitting next to each other, each concentrating on their own section. 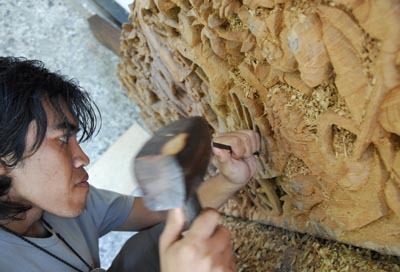 The warm, humid climate is perfect for carving since it allows the wood to dry slowly as it is being worked. Every part of the tree is utilised, even the roots. 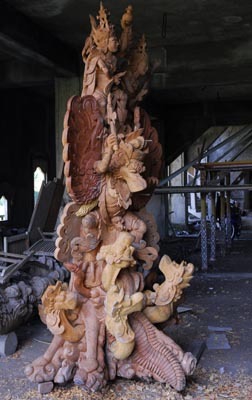 When the carving and sanding have been completed, it is left as is, or multiple layers of colourful paint or lacquer are applied by specialists. 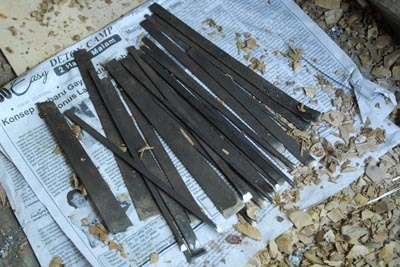 Local blacksmiths forge Balinese chisels and the ends are strong enough to be pounded with a locally produced wooden mallet to remove large chunks of wood. They can also be held like a pencil to carve fine details. Most people are accustomed to work close to the ground in Bali. So instead of carving while standing next to a piece that is clamped in a vice on a workbench, artisans sit on the floor or a low bench and use their feet to grip small pieces while carving. Large pieces are laid on the floor or rest against the wall while they are worked - their weight keeping them steady. I never saw any electric carving or finishing tools in the studios, just chisels, mallets, and sandpaper. Men carved and women usually did the sanding. It is always a challenge to research in a foreign country whose language and customs are so different from my own. Fortunately, I was able to find a wonderful local bilingual guide with a good knowledge of local crafts. Guides are used to driving tourists to museums or eco-tourist sites and most don't have a clue where to find the best craftspeople. If Rudy did not know where to bring us, he would ask around beforehand and then enquire at a few more places along the way, making it an adventure of discovery for all of us. We visited master weavers, jewellers, ceramists, painters, and carvers and his introductions broke the ice and always put the craftspeople at ease. Thanks to Rudy, my husband and I were able to observe high quality carving. The pace was always very relaxed; in fact, most workshops did not get going until around 9 or 10am. 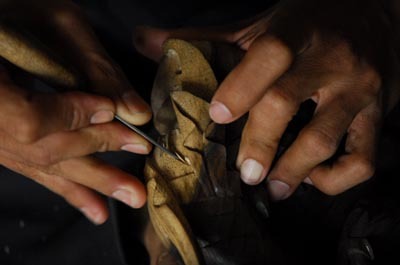 Several towns specialise in woodcarving, including Tegalalang, the home of I Made Ada, an award winning internationally recognised third generation woodcarver par excellence. His son is continuing the family tradition of producing original sculptures of the highest quality. They have been chosen many times to represent Indonesia throughout Europe and Asia, where they demonstrate carving and exhibit their sculptures at international conferences and trade shows. One specialty of Made is intricate high relief panels that feature myths or local flora and fauna in idealised landscapes. Made designs the panels and then supervises Nyoman and his assistants as they carve the thick, wide slabs of wood over a period of several months. 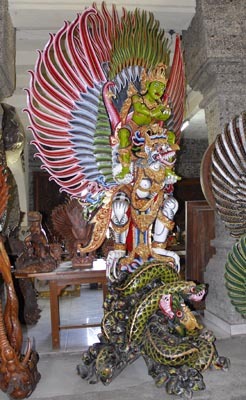 The Garuda (the heroic Hindu bird-like being) which is seen everywhere in the rafters of temples, palaces, and businesses, is also carved in his studio. 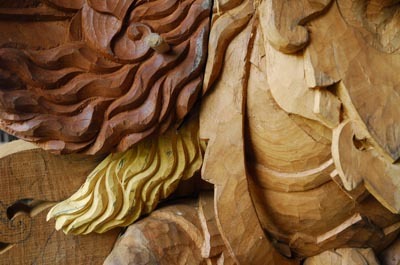 Many pieces of wood are combined to produce these over life-sized sculptures. The thick core and serpent heads are carved little by little, letting them dry between sessions so that the wood will not crack. They were drying the day I visited, so unfortunately, I did not get to meet Made. 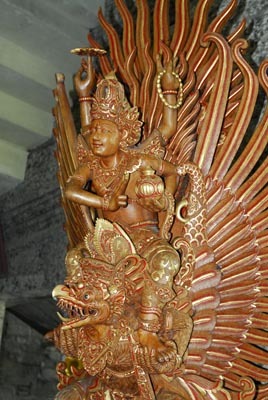 So, in conclusion, Bali is definitely worth a visit, especially to see the woodcarving. Yes, it is so much more than a surfer's paradise. In order to keep this craft alive, Made teaches woodcarving in three to six month long classes to both locals and tourists. For more about Made Ada, please look at his website. He is currently in the process of constructing the Ada Guna Museum at Pakuduwi, Tegalalang 80561, Gianyar, Bali, Indonesia. Until it is completed, his finished sculptures are displayed on the lower level. Made carves in the back and Nyoman and his assistants work near the entrance.